Other number A500 N A500 N Printed in black on a yellow adhesive label found loose inside a bay in the bottom of the case. Other number HKC S/N 108342 HKC S/N 108342 Printed in black on a yellow adhesive label found loose inside a bay in the bottom of the case. 2 1/2 x 18 1/2 x 12 3/4 in. A yellow adhesive label was found loose inside larger of the two bays that have printed-circuit board card-edge connectors inside the case (the bay in the bottom of the case). The label was placed in a plastic bag and replaced in the bay in which it was found.. 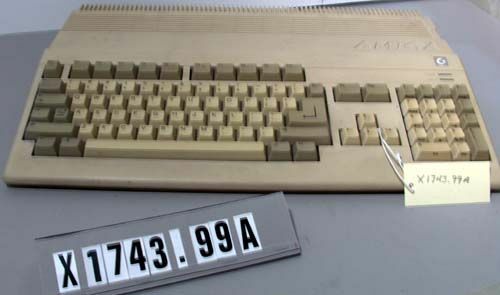 The object has a 3 1/2-inch floppy-disk drive in the right edge, near the back of the case.. The object has a bay opening on the lower left edge of the case, covered with a removable plastic lid, and exposing the edge of a printed-circuit board with 42 connection tabs on each of its upper and lower surfaces.. The object has another, larger, bay in the bottom of the case with a printed-circuit-board edge connector with two rows of pins and 28 pins in each row. In addition to the yellow label mentioned above, there is a white label affixed to a metal plate lining the largest inside surface of this bay. That white label is printed with "Made in Malaysia" and with two rows of numbers that are partially covered by the case. Reading from the left, those two rows of numbers begin, "312502," and "50871," respectively.. The rear panel of the object has a row of 10 connectors, as follows, from left to right: 1, 2) two DB-9-P connectors labeled "1 Joystick," and "2 Joystick," respectively; 3, 4) two RCA-type jacks labeled, "R-Audio," and "L-Audio," respectively, 5) a DB-25-S connector labeled, "Disk Drive;" 6) a DB-25-P connector labeled, "Serial Port;" 7) DB-25-S connector labeled, "Parallel Port;" 8) a 1/2-inch square jack with 5 sockets and a polarizing groove, and labeled, "Power;" 9) a DB-25-P connector labeled, "RGB Video;" and, 10) an RCA-type jack labeled, "-Mono."